It was good to see so many passionate mtbers at the meeting in Church Crookham with the Army last night, whilst the atmosphere did get a little spikey at one point, lots of moderate voices were head and I hope it will act as a wakeup call to the powers that be at the MoD and they will now engage with MTB groups such as TAG. They are considering ideas about how they manage public access – zoning was mentioned. They will appreciate they will need to consult on these following last night. 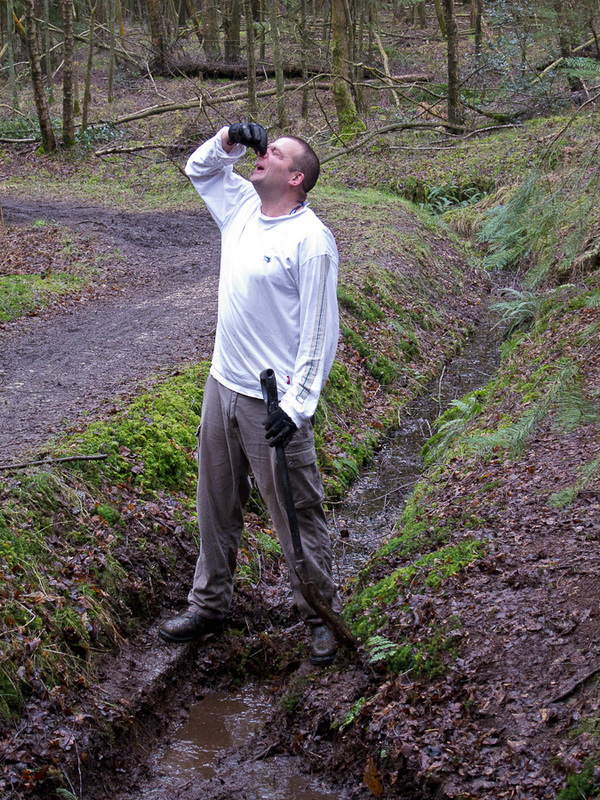 Whatever they think about mtbers it’s nothing compared with how much they dislike dog poo! TAG has got the Lt Col.’s email address and we’ll be trying to engage him directly about a way forward (if nothing else to show him some singletrack so he knows what he is dealing with). We’ll obviously keep everyone informed and we’d welcome hearing from anyone who wants to be engaged. Finally I’d like to ask all local riders to read the Code of Conduct that is on the TAG website – if we all follow this we will be able to reduce conflict to a minimum and hopefully avoid draconian measures. As you may be aware 6 months ago TAG wrote a position paper setting out what we saw as the potential management options for MTBing on MoD land around Aldershot. We did this primarily to set our cards out on the table and to better understand MoD’s official position. We have now had a response from MoD which is attached to the bottom of this post. As you will see, whilst it is not a wholly negative response, it does not significantly move the discussion towards sustainable use of MoD land by MTBers. Continue to be available to the MoD if and when they decide they wish to engage with the MTB users. Act as a key lobby group when the Aldershot Military Lands Byelaw review is undertaken to formally provide submissions advocating legal recognition of cyclist use of the land beyond the current restriction to byeways and made up roads. Whilst TAG appreciates this isn’t great news, we will continue to pursue the above areas with vigour. 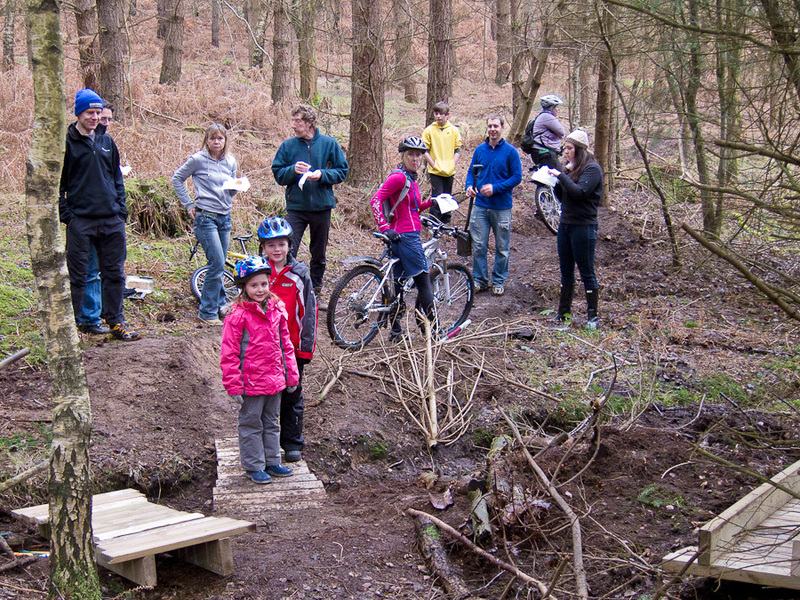 We would of course welcome any feedback from MTBers on the position paper and MOD’s response. 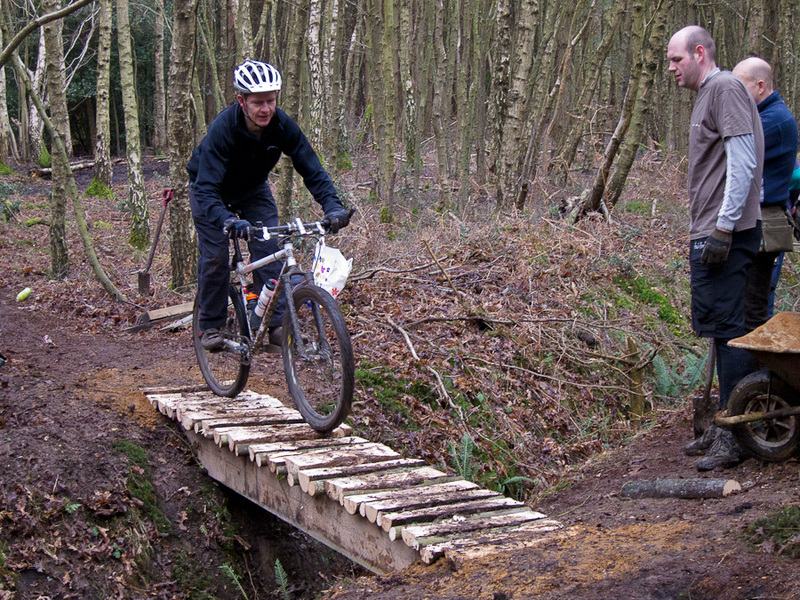 We will continue to press for the MoD to recognise mountain biking use of the Aldershot Military Lands – please note that the situation is slightly different on Hankley Common in that the byelaws only allow cycling on bridleways rather than bridleways and fireroads as on the Aldershot Military Lands. EDIT: Please note, that riding on the bridleways is still permitted. When riding on the Defence Estates training areas it is important to be aware of the byelaws that apply to cyclists and how this might affect you. The following is TAG’s considered advice to everyone using the military land for cycling. Please do not mistake the following as legal advice – it is not. The byelaws mean that it is legal for any member of the Armed Forces (with military ID and of NCO rank or above) or the MoD land managers (LandMarc) to request that you leave the training area; this is at their discretion. There are no rules for this, so if they say go, you go or face the consequences. So if this does happen then leave with good grace and ride somewhere else that day. Ultimately, the above officers have the right to seize your treasured bike and take it into custody for subsequent crushing. You have no right of appeal or compensation if this happens so don’t escalate any confrontation forcing them to take this step. Generally, any enforcement patrol will start with a warning and then escalate it only if you continue to offend in the same training area. Should the worst happen, they are required to provide you with a ‘Warning Off’ notice in writing and confirmation that they have confiscated your bike. Enforcement patrols for the training areas can occur at any time night or day. TAG day – 28th Jan – thanks to everyone! Well done to the T.A.G. trail workers. When 10am dawned on Saturday morning and there were only 5 people at the meet point I must say I was worried that we had lost your enthusiasm. But lo and behold within 10 minutes another fifteen people had appeared and the final turnout for the day was a record twenty two people and a few assorted children of various sizes. The weather was generous and stayed dry for the day, although woolly underwear was a good idea as it was a bit nippy in the woods. 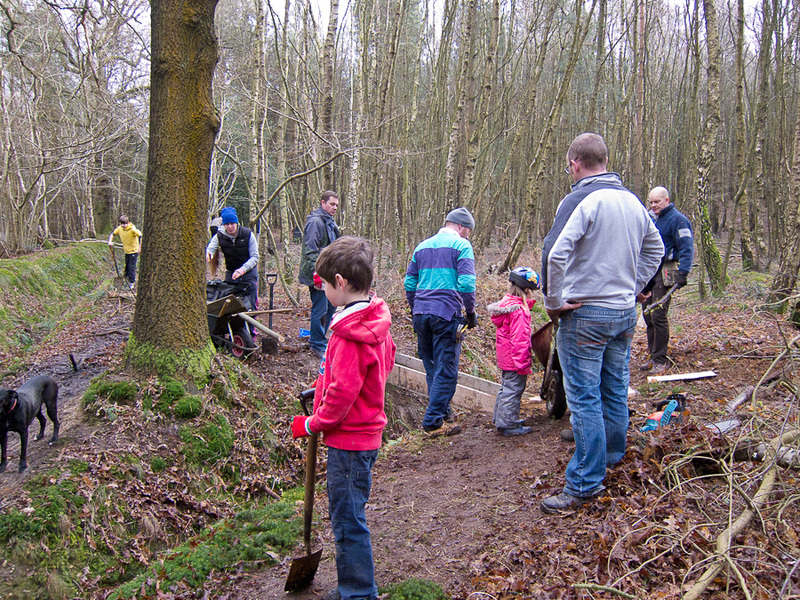 The team split into two work parties and set off for a day of tidying up in the area of Bunker Buster where winter rain had created some erosion problems. Everyone pitched in and the path culverts were cleared out including some incredibly smelly bits (well Stan swore it was the drains). One trail that had got very muddy was re-routed to more stable ground and the old route closed off. The tea break was greatly improved by the cake donations from Jo and others. Where the route crossed ground that was inherently very wet, some low level boardwalk was installed to stop any further erosion while protecting the drainage. 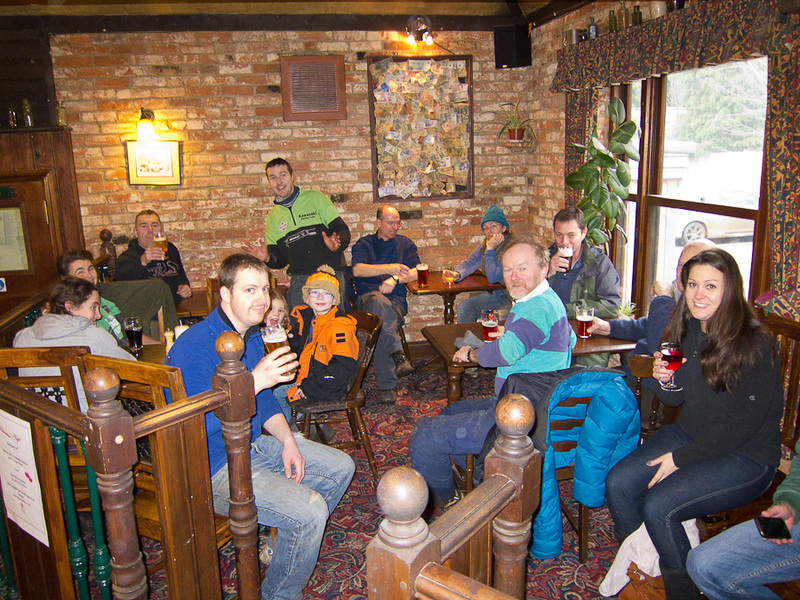 We finished off at lunchtime with a visit to the Tweseldown pub to refresh adults and children alike. Mike ,Kate , Rachy and family, Gayle, Simon(Sandy Hill) and son.